﻿When we first encounter a new material or idea, we instantly strive to understand it. We can enter this quest through any of the three phases above, but to thoroughly feel comfortable, time must be welcomed for all of them. 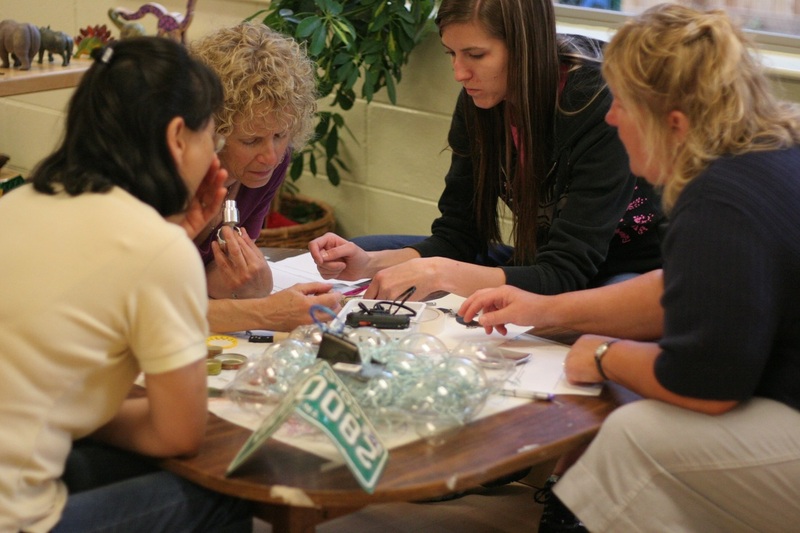 A group of 30 teachers were invited into a room filled with recycled materials of all kinds. The teachers were informed that they would have roughly 90 minutes to work. They could work alone or in groups. Then the facilitators stepped back. Some of the teachers immediately walked to the table of materials and began touching them, investigating them, collecting them (Phase O). Some of the teachers gathered to talk with one another, forming their own learning groups to plan their strategies (Phase ▢). Some of the teachers walked right to the questions to get a feel for which one spoke to them (Phase Δ). As the teachers worked, they were observed visiting all three phases, staying with some for longer periods of time than others – each moving at an individual pace. In this way, they were able to work not only with content that was compelling to them, but also with learning styles that were individually designed. There were very few questions for the facilitators, and engagement was high. Children exhibit similar patterns and levels of engagement when working in such a personal manner. Typically, the younger a child, the more likely she is to enter an investigation of the unknown through the O phase. As she works, she dances from one revelation to another without looking back. Often she reencounters earlier ideas. These multiple exposures help form theories more solidly in her mind. As the child gets older, the other phases come into play in a stronger fashion. Time spent with the O phase produces a sense of confidence and intimacy with the material, which in turn leads to creativity and innovation. “Messing about” effectively with materials and ideas requires a very delicate balance. The presence of the teacher is subtle, space and time for the children’s unrestricted exploration is crucial – but the hand of the teacher is nonetheless very present. She must be there to recognize threads of interest and to ask the questions that will provoke new thoughts for the investigation. Traditional instruction requires that each minute in the school day be accounted for. The thought of a classroom with no plan or order, one that might be considered laissez-faire, is frightening. A classroom that employs messing about is neither authoritarian, nor permissive. Rather, as Frances Hawkins knew, the teacher is always engaged, whether as observer or participant. Frances and David understood the dance of watching, questioning, talking. They knew that the classroom belonged not only to them, not only to the children, but rather to the collaboration. To read more about the idea of Messing About, please read the essay, “Messing About in Science” in The Informed Vision.